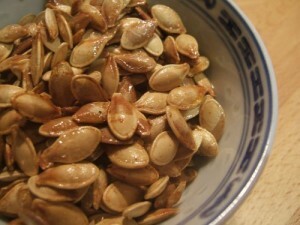 Pumpkin seeds are the perfect snack and are very simple to make. This is how to cook pumpkin seeds in the oven. Begin by pre-heating the oven to 400 degrees. Make sure you separate the seeds from the pulp of the pumpkin. Rinse the seeds in a colander, pat dry and place on a baking sheet. Sprinkle about ½ tsp. of kosher salt (use more or less, depending on your taste). Place the baking sheet in the oven for about 10 minutes, or when the seeds are golden brown. Set them out to cool. After learning how to cook pumpkin seeds, it is also valuable to understand their health benefits. Pumpkin seeds are high in fiber, B vitamins and magnesium. So, eat them by themselves for a tasty snack, or add them to your meals for something different (pumpkin seeds are great in salads and soups).